Who says you can’t make baked desserts in the backcountry? 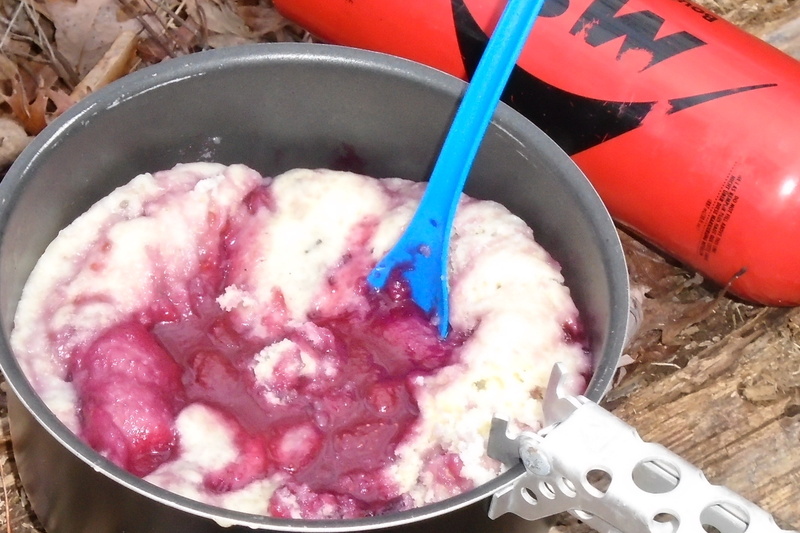 This recipe is a great winter calorie boost – a sweet fruity treat cooked on a backpacking stove with no special equipment. Good enough to cook at home! You’ll need a stove where you can adjust output, and two nesting backpacking pots (the larger should be about a quart-size). Recipe is for four – you can reduce or expand, but as shown its built around a single 12-oz. bag of frozen berries. The attached video shows how it’s done! – Pack 3/4 cup sugar and 1 tsp. cornstarch in ziplock sandwich bag #1. – Mix all dry ingredients for cake (flour, sugar, baking powder, powdered milk, salt) in bag #2. -Measure and pack shortening in bag #3 (Crisco is available in shelf-stable sticks, like butter). – Mix lemon juice and whiskey and pack in small spill-proof container. 1) In the smaller of your two pots, boil 1 cup of water and sugar (Bag #1) for 5 minutes. Add berries and cook uncovered until they burst. Remove from heat. Add lemon juice and whiskey. Stir well. 2) While the berries are cooking, peel the shortening (Bag #3) enough to grease your larger pan, then squeeze the shortening directly into the dry mix in Bag #2. Seal the bag and knead it by hand, squishing all the shortening lumps and mixing evenly. Add 1/3 cup of water to the bag, reseal, and blend with your hands, feeling for and eliminating lumps. It should become smooth, and the consistency of pancake batter. Pour this into the bottom of your larger pot. 3) When the berries are done and off the stove, turn down the heat as low as you can without shutting it off, then place the batter-pot on the heat. Pour in the berries. If some of the batter floats, that’s ok, it will happen once the convection currents get going anyway. 4) Cover and cook on low for about 25 minutes or until the dough is the consistency of cake – it will tear, not stretch or run. During cooking the cobbler will “invert” to a degree, with clumps of batter rising to the top of the mixture and blending itself into a cobbler consistency. 5) Share, and make new friends!